We’re incredibly lucky to be having a short week this week here in most of Australia thanks to a long weekend honouring the birthday of Queen Elizabeth, whose birthday is actually in April. I’d been looking forward to this weekend since the beginning of March as this was my first weekend in four and a half years that I did not have to do any homework for any educational purposes. It was my first weekend of freedom. To celebrate, we went and visited my parents who will soon be visiting England (my dad was born in London and came to Australia as a boy with his parents, he hasn’t been back to England since arriving in Australia in 1967). They’re gone for 5 weeks, so it seemed only right to spend time with them before they leave. Along with visiting my parents, we did a spot of shopping. Nothing new, of course. Before arriving to my parents’ place on the Bellarine Peninsula, we stopped off at Vinnies Geelong West. I had it on good authority they were open for the day, and I’d been waiting a little while to set foot in the store. With ample street parking in Pakington Street, and a small carpark adjacent the store, Vinnies Geelong West is located perfectly for those travelling by car. The Mister managed to snaffle a spot in the car park, right next to the car park entrance. Having never set foot in the store, I wasn’t sure what to expect. Op shops can be hit or miss. 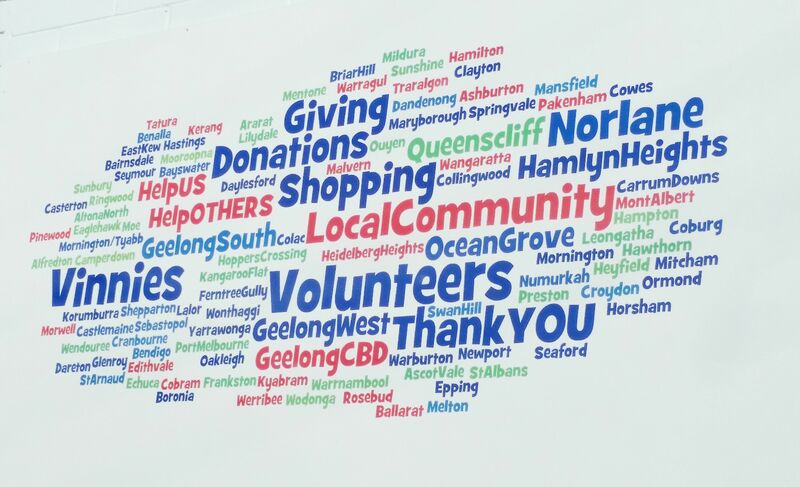 Vinnies Geelong West was definitely a hit. As soon as we walked in, like a moth to a flame, I was captured by the display case with all the pretty jewels, crystal, and other special pieces that you would normally find in the cabinets at the register. It’s almost as if I have an inbuilt radar: as soon as I step in an op shop, I am guided toward the pretty shiny things in the cabinets. I couldn’t get quite close enough to begin with because of two boxes containing donations that were in front of the cabinet. 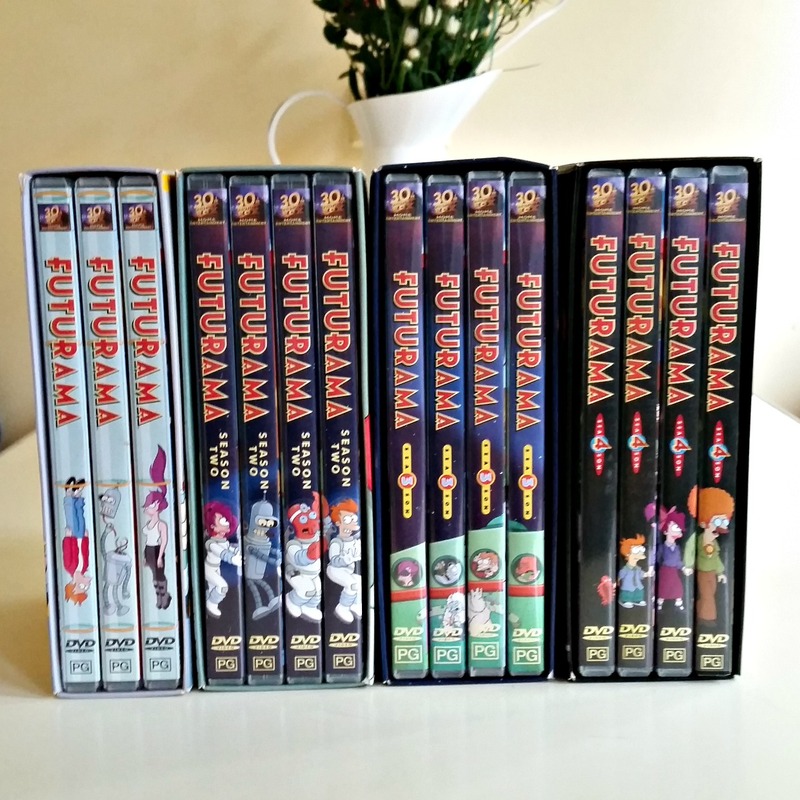 These boxes held donated gold in the form of four complete seasons of Futurama on DVD. They hadn’t even been priced yet they were so fresh. I can’t recall what the normal sell price is per DVD as The Mister was enquiring after them as I checked the racks for some new tops, but we ended up picking up seasons 1 – 4 for the bargain price of $25. I cannot wait to sink my teeth into these. I’ve only ever seen episodes here and there, so being able to watch the first four seasons ad-free is going to be amazing! Now to find seasons 5 – 7 to complete the series. For all the clothes I have in my wardrobes (yes, I say wardrobes, but it’s really only the equivalent of one wardrobe when we share both wardrobes between the two of us), I honestly do not have enough tops. I’m forever buying dresses and cardigans, but it’s rare that I find tops that I like to match my existing wardrobe. Imagine the excitement when I found three tops, and I didn’t even look at all the racks of clothing, only three or four! 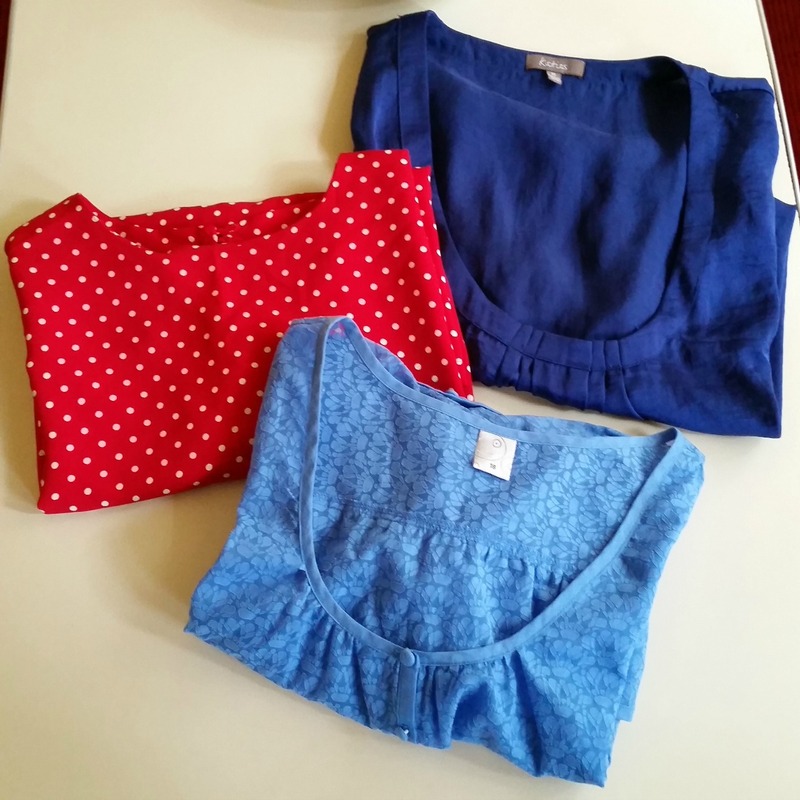 The Katies brand royal blue top features a scoop neckline with pin tuck pleats at the neck, and capped sleeves. A poly blend I’m sure (it’s in the wash so I can’t even check! ), but it’s so soft and silky to the touch, it will be perfect for client meetings, relaxed evening wear, and smart day wear. Next is what appears to be a handmade top – no tags to be found at all. Again, I could only hazard a guess to the fabric composition, but it’s lightweight and airy. There’s a single button closure at the nape of the neck. 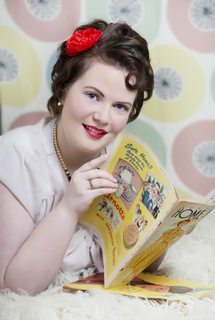 I love the fun of the polka dots, so bright and cheery, but also practical. The third top, a Target top, is a sheer button up with a cute deco floral pattern (I’m only just seeing that now, I’d been seeing other patterns all week). I’m looking forward to dressing it up and dressing it down. I’ll need to invest in some basic spaghetti strap tanks to wear underneath it but I cannot wait to add this to my wardrobe. Tops ranged between $3 and $5. 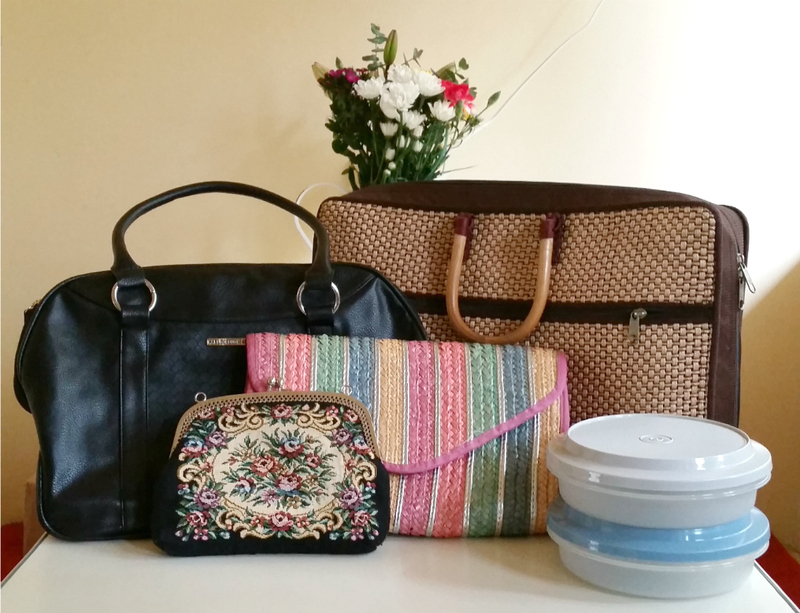 I’m slowly rebuilding my bag collection, and these four bags from Vinnies are the perfect additions. Finding the perfect black bag hasn’t been easy, and this black bag ticks a whole lot of boxes. It’s in great condition, is quite sizeable, has a few inner compartments, and is big enough for me to carry everything that I need to. The large woven bag with the bamboo handles is fabulous: it’s got a double zip closure on the exterior, and the internal compartments are sheer! You can see everything all at once, including the contents of the outer compartment. The small tapestry bag is without a handle, but nothing a trip to Spotlight won’t fix. Unless, of course, I can find handles in an op shop. My favourite find of all the bags was the oversized straw clutch. The bright colours, the silver stripes, and the size: it’s so joyous and reminds me of ice cream on a sunny day. The Mister found the two Tupperware containers to add to our collection. He’s learned quickly the value of Tupperware, as well as the quality, bless him. Bags ranged from $2 to $5, and the containers were $3 each. Having grown up in Geelong and living there until just 5 years ago, I’ve always known about the Mill Markets. I’d been there a handful of times since it moved to its current location in Newcomb since the early 2000s, but I don’t think I’d ever been upstairs. Needless to say I had only one mission: to get upstairs. Pulling into the completely full car park, I was feeling a little overwhelmed knowing there would be a lot of people around indoors. While I did make it upstairs, and although we were there for a length period of time, I tired quickly and ended up feeling overwhelmed by a multitude of factors. 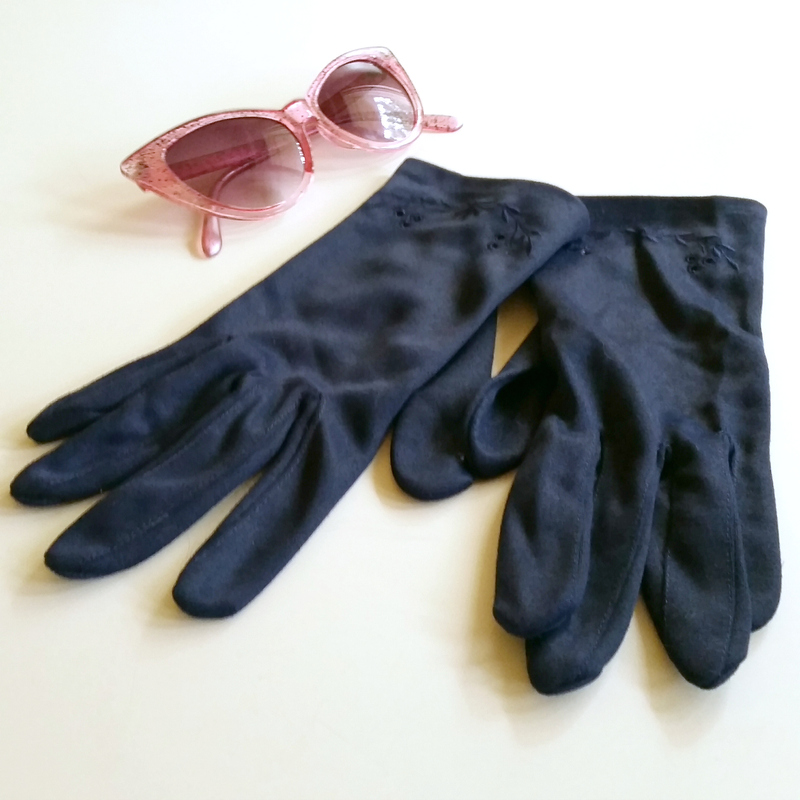 I did manage to pick up some 1950s inspired cat eye glasses (taking my collection to 3 pairs) and some gorgeous 1950s/1960s navy gloves with delicate embroidery at the wrist. I was also toting around a light blue pair of 1950s gloves with these two items, but left those behind for someone else to love. I’m quite pleased with our finds, and look forward to sharing more of my finds – interjected with my lust haves found online, of course – with you. How did you spend your weekend? Did you spend any time in op shops, thrift stores, or vintage shops?